U CAN NOW SLEEP IN A DOG, yes IN! Calling all dog lovers, isn’t this adorable???? This is one reason why I LOVE traveling despite being afraid of taking the plane. All the discovery and culture exchange you get is priceless. For my USA readers or fellow bloggers, have you been or seen this before? Share with me please! 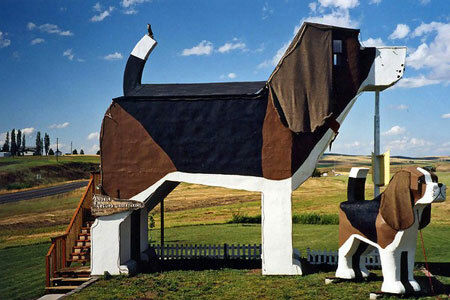 Dog Bark Park Inn is a Bed and Breakfast guesthouse inside the World’s Biggest Beagle. Guests enter the body of the beagle from a private 2nd story deck. Some of the dog’s decorative furnishings are carvings by Dog Bark Park chainsaw artists Dennis and Frances. Inside and up another level to the head of the dog is a loft room with additional sleeping space plus a cozy alcove in the muzzle. Dog Bark Park Bed and Breakfast is located in north central Idaho on US Hwy 95 at Cottonwood, Idaho in the heart of the Camas Prairie where wheat, barley, canola, blue grass and hay are the dominant crops. Guests staying at the Dog Bark Park Inn Bed and Breakfast wishing to explore the area and take advantage of popular activities including scenic drives, hiking, horse back riding, ATV riding, mountain biking, small town festivals, summer rodeos, fish hatcheries, berry picking and bird watching. Dog Bark Park Inn offers an expansive continental self-serve breakfast. Offering a variety of teas, coffees, juices, fresh fruits, boxed cereals, milk, yogurts, cheeses, hard-boiled eggs, bagels, home-baked pastries. Smoking is permitted outdoors on ground level only. ya, this is soooo amazing isnt it? the interior looks good too. you can check more of the pics from the link… 😀 yes, gorgeous view. im not a super big dog lover but this is really cute.. will be damn cool to try it ! ya emomosabelle, will be damn cool to get the chance to try it. Lol how unique and cool!